The State Theatre’s color palette for the auditorium honors the beux arts design from the 1920s. The bold colors, ombre gradation, and stencil techniques help tell the story of a grand movie palace, unlike anything Sioux Falls had ever seen. 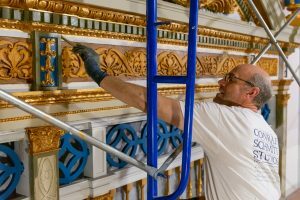 With over 120 years of experience, the restoration team from Conrad Schmitt Studios is uniquely qualified to provide the color matching, decorative painting, and restoration expertise needed to bring the State’s most ornate area to life. 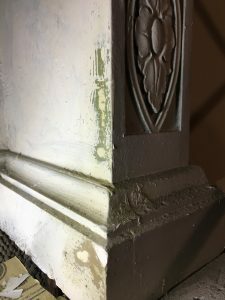 The chamber restoration team relied heavily on discovery work, which involves finding any original elements and colors that remain. Discovering an old paint rag with some of the original colors and a torn piece of fabric that hung from the inside of the chamber, gives the artists clues and confirmation on color choice and placement. The restored organ chamber is a living testimony to the extraordinary design and construction of the Theatre. While to the eye, the State’s interior may seem damaged, the walls still stand, the floors are secure, the ornate details are relatively intact, and thanks to careful maintenance over the last decade, the majority of the Theatre’s original features are still in place. 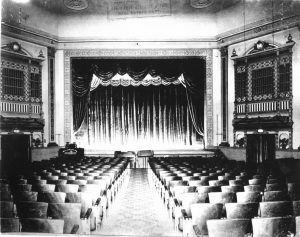 When restoration throughout the auditorium in complete and the State Theatre opens the doors to the public for the first time in almost thirty years, patrons will see (and we hope feel) almost exactly as they would have in 1926, the year the State opened. 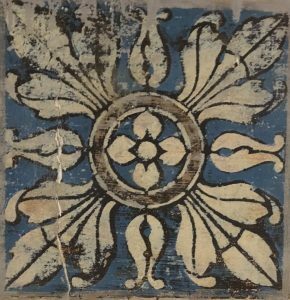 Historic Photos, like the one seen here, can be used to help recreate patterns, carpeting, lighting and ornamental plaster. For nearly fifteen years the Sioux Falls State Theatre Company has been celebrating, documenting, and promoting the architectural, cultural, and social relevance of the State Theatre. However, we can’t do it alone. Support from cinema lovers, architects, historians and people like you are paramount to our success. Help us preserve the rich history of America’s greatest theatres – Donate Today!